Director Roland Emmerich, the maestro of the dumb fun blockbuster, is never going to get the credit he deserves but the man is something of a mad genius when it comes to putting together spectacle-rich, low-calorie but still satisfying summer entertainment. Take White House Down, the second of 2013’s Die-Hard-in-the-White-House movies. It’s really more of a buddy film contained to that famous structure. It’s not a smart blockbuster by any means but it makes up for any and all flaws with its sheer overpowering sense of fun. Stuff gets blown up real good, the action is brisk, and there are satisfying payoffs for story elements that felt like they were, at first glance, merely thrown together. You may walk away surprised at how much you’re enjoying the comedic interplay between Secret Service agent Channing Tatum and president Jamie Foxx. Plus it’s fun to see the president in on the action instead of merely as a hostage, like the earlier Olympus Has Fallen. 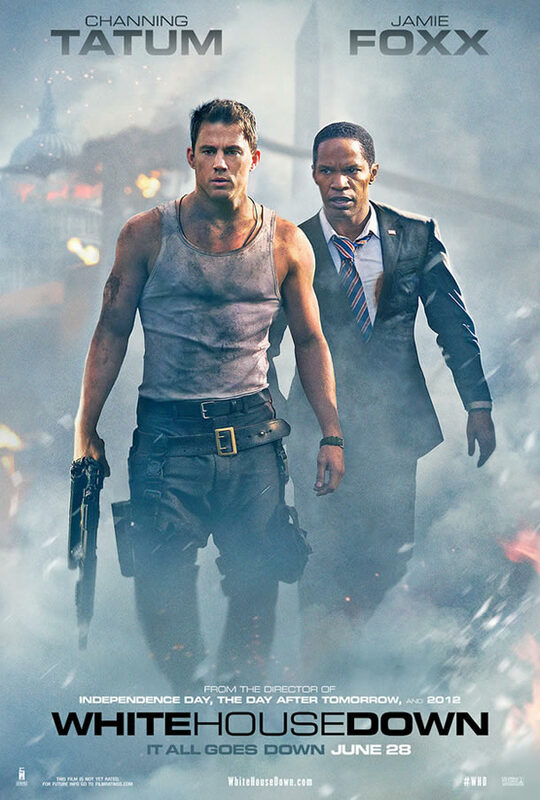 In direct comparison, I’d have to say White House Down is the better of the two movies, both in payoff and action. It’s nice to have a movie that’s just fun to watch, that goes about its blockbuster business with precision, supplying a few decent twists, and giving us heroes worth rooting for and action sequences that are well developed and that matter no matter how ridiculous. Emmerich movies are blissfully free of self-serious malarkey, though his weakest hit, 2004’s Day After Tomorrow, got a bit preachy. His movies know what they are and know the demands of an audience. What I needed this summer was a movie designed to make me cheer the impossible. White House Down is a romp. Posted on June 30, 2013, in 2013 Movies and tagged action, channing tatum, james woods, jamie foxx, jason clarke, joey king, maggie gyllenhaal, presidents, richard jenkins, roland emmerich, thriller. Bookmark the permalink. 1 Comment.